How to Play commercial (encrypted) Blu-ray Disc Movies? I do have a question. What do you use to play commercial (encrypted) Blu-ray discs in Windows? I tried to do the VLC solution but it crashes as soon as I try playing an encrypted disk. I refuse to pay a dime to cyberlink since I just bought this bluray player and their OEM version will not support windows 8. Is there a great blu ray player software well for playing commercial (encrypted) blu-ray discs? Anyone have any suggestions on this? Commercial Blu-ray Discs are copy-protected and will not let you easily play the movies to PC or backup/copy them to blank discs. AACS and BD+ copy-protections are implemented to almost all the Blu-ray movies on sale. In another word, you will not able to enjoy commercial Blu-ray Discs unless you have a blu-ray drive and a professinal blu-ray player software. UFUWare Windows Blu-ray Player is an excellent Blu-ray player software for Windows. It can play any commercial (encrypted) Blu-ray Disc, Blu-ray ISO file, and Blu-ray (BDMV) folders on all Windows operating systems, including Windows 8.1. Besides Blu-ray media formats and other hot video media formats are playable with it. This software also can magically play Blu-ray on iOS devices. Step 1: You can choose the favorite commercial (encrypted) Blu-ray Disc and inset it to the Blu-ray drive, the internal or external Blu-ray drive are both available to use. 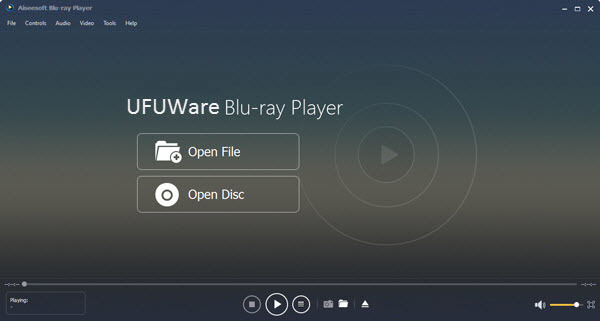 Step 2: Then you should download UFUWare Commercial Blu-ray Player Software at here and install it on your computer, and then launch the program to pop up the main interface. Step 3: Click “Open Disc” button and select the Blu-ray drive to load the commercial (encrypted) Blu-ray Disc to the program. And the program would play the commercial (encrypted) Blu-ray Disc automatically for you.